A fine piece of work has been issued, compiled by the Northeast Iowa Press association, with the travel bureau located at Elkader. J.A. Druyor of the Elkader Register, was chairman of the committee that issued the map and folder. It is entitled the "Little Switzerland of America." The work represented a great deal of detail and painstaking effort in compiling, the printing being done in a most artistic manner in colors. 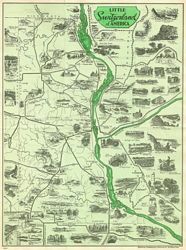 It was first planned to include Fayette and Winneshiek counties in this folder also, but lack of financial support made this impossible, hence the two Iowa counties and two across the river in Wisconsin make up the folder. Marquette - Pontoon bridge, scenic drive, Oakcrest, Indian Mounds, Old Military trail, Suspension bridge. McGregor - Indians, Wild Life School, McGregor Heights, Pikes Peak, Pictured Rocks, Sand Art, Lotus Lillies, Boating, Aquarium, Bird Museum and Gold Course. Postville - The Old Stone House, Trout Fishing and side trips. Prairie du Chien - Fort Crawford, Trading Posts, Villa Louis, Churches and Cemeteries, Indian Village, College and Academy, Newlson Dewey State Park. Of course there are many more but these are the outstanding items mentioned. There are numerous scenes portrayed of varied interest. Everyone should secure a copy of this beautiful brochure, and it will aid them materially in picking out their Sunday drives and help to disseminate the information contained among their friends from a distance.